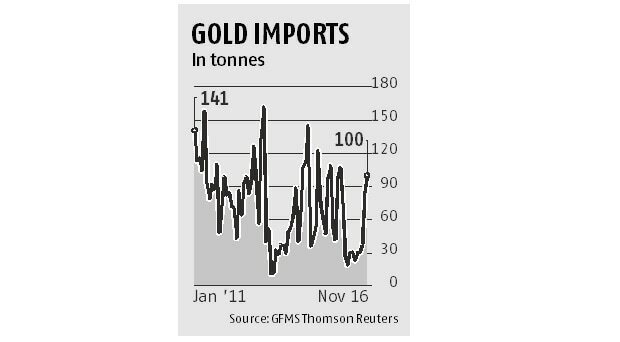 India’s gold import in November was the highest in this calendar year, due to a sharp increase in demand from bullion dealers and stockists. Trade sources estimate import at 100 tonnes, as compared to 98 tonnes in the same month last year and 84 tonnes in October. Dealers and stockists were anticipating a sharp rise in jewellery demand this wedding season, before the demonetisation of high value currency notes was announced on November 8. With that announcement, consumer demand for gold jewellery halted, resulting in a cascading effect on gold demand from jewellers, too. “Import rises after Diwali, as jewellers book bullion for preparations of ornaments for the forthcoming wedding season. But, of the estimated 100 tonnes of import, around 70 per cent could be lying in the vaults on evaporating consumer demand,” said Prithviraj Kothari, managing director, RiddiSiddhi Bullions, a dealer at Zaveri Bazaar here. Also, since the government cancelled legal validity of Rs 500 and Rs 1,000 notes, the income tax department has been conducting search and seizure operations on jewellers across the country allegedly involved in illegal sales for old currency notes. The department has seized a huge quantity of gold jewellery meant for delivery. And, many transacting in cash face a huge slowdown. Especially so for recovery of gold from old jewellery; jewellers could not pay customers in cash. Jewellery is usually sold for an urgent cash need; this process has halted. Only the organised sector entities, dealing only in electronic payment, faced no problem. “Owing to demonetisation, the ability to transact business in cash has disappeared. Our business, however, has not impacted at all; cash transactions never existed on our books,” said Rajesh Khosla, managing director of MMTC Pamp, the only primary gold metal refinery with London Bullion Market Association certification in India. “Trust on gold as the last resort will go up. Gold has been used as a store of value for ages and no authority can ever demonetise or devalue it with a decree. People will want to invest in gold as a back-up for tough times. However, gold sales will be impacted in India if interest rates come down. A lot of consumption will move towards purchase of white goods, cars, homes and vacations. The only silver lining would be for the very low income group, dependent on loans against gold. These people will be able to avail of such loans at a lower interest cost,” said Kothari. Meanwhile, jewellers have urged the government to reduce the import duty on gold from the present 10 per cent to six per cent.